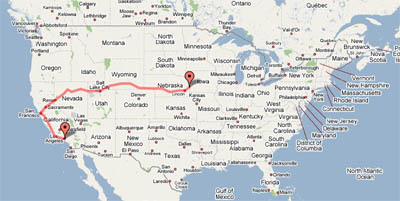 Starling Fitness - Fitness, diet, and health weblog » Race Across USA: Bye, bye, Omaha! Race Across USA: Bye, bye, Omaha! We just passed Omaha, Nebraska on the Race Across the USA! We didn’t even stop for a break! At this rate, we’ll be to Chicago in no time! The “Talk Trash” comments have turned hilarious. If you aren’t running with us, you’re missing out, so I’m sharing them with you! Starling Fitness (3 days ago): 1612.63 miles! We’ve hit the 1/2 point in Nebraska! krisjames (2 days ago): Man, that’s alot of corn! krisjames (yesterday): Are we there yet… Are we there yet… Are we there yet?? LauraMoncur (yesterday): Quiet down or we are staying at the Holiday Inn without a pool! Starling Fitness (26 seconds ago): 2028.04 miles! We passed Omaha without stopping! You kids have been so good that we’re staying at the hotel with the pool AND the slippery slide! 1st place – Most miles run – Four DVD set of Starling Fitness walking videos: Swami’s Beach, Sugarhouse, Moab and the as yet unreleased San Antonio Riverwalk. 2nd and 3rd place – Choice of three Starling Fitness DVDs. 4th and 5th place – Choice of two Starling Fitness DVDs. I’m just going to give you a teaser for our next race: Louisiana Purchase. Anyone want to guess the route? Since Nike’s system isn’t set up for a cooperative event like this, you will need to check here at Starling Fitness for progress and winners. We reserve the right to limit participation in the challenge due to our time constraints or the limits of Nike’s system. This event is not sponsored by Nike or Apple. 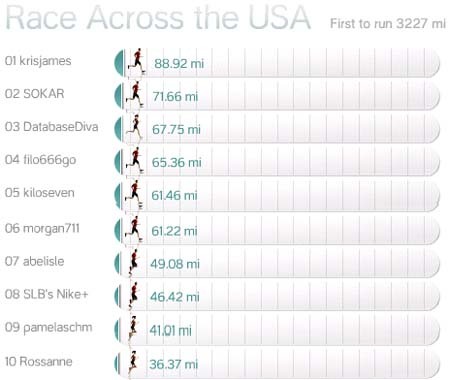 Starling Fitness will choose the winners based on total mileage. Our decisions are final. Next: Is Subway Better Than McDonald’s?